50-60 fans gathered in the cold at Nationals Park this evening for a showing of fan loyalty and solidarity in support of abducted catcher Wilson Ramos. The gathering, organized hastily late yesterday in a grassroots effort lead by twitter user Alicia (@dragballwramos), brought together a number of smaller fan groups into a cohesive whole, sharing stories about fan encounters with the Nationals’ young catcher. Ramos is being held by parties unknown after being captured late Wednesday outside his family home in Valencia, Venezuela. The Nationals and Major League Baseball, joining with Venezuelan authorities, are working to secure Ramos’ return. Update, 10:08pm: Word from the Interior Minister of Venezuela tonight says that Wilson Ramos is being returned to his family after being rescued from captivity. 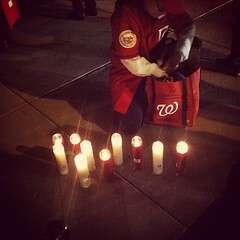 Very glad to see that Ramos will be returned to his family, answering the prayers of many at Nats Park this evening.